1. More trouble in mall land: Wall Street is bracing for more signs of the retail apocalypse this week when Macy's and Nordstrom (JWN) detail the latest pain from the loss of mall shoppers who've migrated online. Worse than slumping sales, department stores are likely to paint a gloomy picture about their busiest and most critical time of the year. 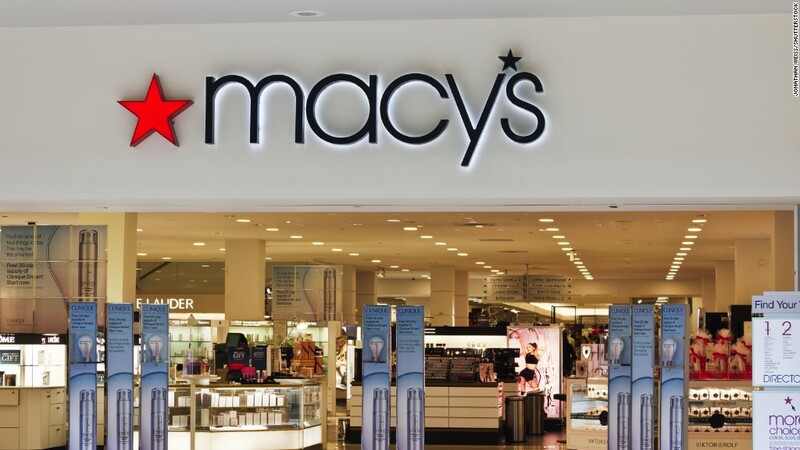 Morgan Stanley recently warned that sales will outright decline during the holiday quarter at both Macy's (M) and Nordstrom. The obvious reason for shrinking sales is that fewer and fewer Americans are heading to the malls to do their Christmas shopping. Instead of battling the crowds, they're finding great deals and more convenience on Amazon and elsewhere online. Not only is online shopping growing more popular, but Amazon (AMZN) is becoming an increasingly-powerful player, despite serious efforts by Walmart (WMT) and other traditional retailers to catch up. Boosted by innovations like Alexa and its Dash buttons, Amazon is expected to capture 35% of total e-commerce sales during the fourth quarter, according to Morgan Stanley. That's up from about 20% in early 2016. Amazon has become such a dominant player that Morgan Stanley estimates it accounts for half of all U.S. retail growth, up from just 17% in 2013. No wonder why investors are fleeing department stores and flocking to Amazon, whose stock is up 48% this year. Macy's stock is down by almost exactly the same amount, while Nordstrom is off by 20%. The environment is so bleak right now for brick-and-mortar retailers that Nordstrom has suspended its efforts to go private. The department store had hoped to reinvent itself to avoid the harsh scrutiny of Wall Street, but financing dried up following the Toys 'R' Us bankruptcy. Nearly 7,000 stores have already closed this year, taking out the previous record set during the 2008 financial crisis. That trend may not be done yet. 2. Trump's tax bill goes under the microscope: The House Ways and Means Committee will begin its markup of the GOP tax plan on Monday. As it stands now, the Tax Cuts and Jobs Act would permanently lower the corporate tax rate to 20%, increase the standard deduction for individuals and households and eventually repeal the estate tax. The committee has its work cut out for it. President Trump promised that a tax reform bill would be completed by Christmas, but he noted that "there is much work left to do." And some Republicans have already voiced opposition -- Rep. Lee Zeldin of New York tweeted that he plans to vote against the bill in its current form because of its elimination of the deduction for state and local taxes, also known as SALT. Some business groups have also come out against the bill. The National Association of Home Builders called the plan "disappointing" because it doesn't do enough to support homeownership. 3. Saudi arrests catch one of the world's richest men: Saudi Arabia's Prince Alwaleed bin Talal has been arrested as part of an anti-corruption sweep in the kingdom. Prince Alwaleed owns major stakes in such companies as Apple, Twitter and Citigroup. Reports of his arrest saw $750 million wiped off his fortune Sunday. On Saturday, Saudi Arabia announced the formation of an anti-corruption committee by King Salman bin Abudlaziz Al-Saud. King Salman ordered the purge as part of an "active reform agenda aimed at tackling a persistent problem that has hindered development efforts in the Kingdom in recent decades," the Saudi Ministry of Communications said in a statement. Early on, the Trump rally was a massive bet on his pro-business promises to slash corporate taxes, rip up regulation and unleash infrastructure spending. Investors largely ignored his market-unfriendly proposals on trade and immigration. Stocks continued to hit new heights as the economy gained steam and corporate profits are boomed -- even as Trump's legislative agenda largely faltered. All told, the S&P 500 has soared about 21% since Trump's election. That's its third-best performance under a new president, behind President George H.W. Bush and President John F. Kennedy, according to CFRA Research. Trump touched down in Japan Saturday as part of a 13-day trek through Asia. He hopes to consolidate support in Asia for his combative approach to North Korea and to lay out an assertive approach to negotiate trade agreements. 5. Economic snapshot: The Bureau of Labor Statistics is set to reveal job openings and labor turnover data for September 2017 on Tuesday, following the best jobs report of the Trump administration. The turnover rates have been fairly steady this summer. In August, there were 6.1 million open jobs and 5.4 million new hires. We'll also get a sense of how far people are willing to stretch their wallets with the release of the University of Michigan's monthly consumer survey. So far, American shoppers have been feeling good: Confidence ticked up by 5.9% from September to October, and increased 15.5% from October 2016 to the same period this year. Not a bad way to enter the holiday season. 6. CVS, Disney and other earnings to watch: Several high-profile brands are set to discuss their earnings this week. A few are especially worth keeping an eye on: CVS (CVS) is set to report on Monday, and the pharmacy's executives could be grilled on news that CVS may buy Aetna in the largest American health insurance deal of all time. On Thursday, Disney (DIS) plans to share its fourth quarter financials. CEO Bob Iger warned in September that earnings could be flat this quarter. Investors fear that could be due in part to ESPN's poor performance -- the network has been shedding subscribers, and spent much of the fall embroiled in political controversy.